The Papal Basilica of St Paul Outside the Walls (Italian: Basilica Papale di San Paolo fuori le Mura), commonly known as St Paul's Outside the Walls, is one of Rome's four ancient major basilicas or papal basilicas:[Notes 2] the basilicas of St. John Lateran, St. Mary Major, and St. Peter's and Saint Paul Outside the Walls. James Michael Harvey was named archpriest of the basilica in 2012. The covered portico that precedes the façade is a Neo-classicist addition of the 19th-century reconstruction. 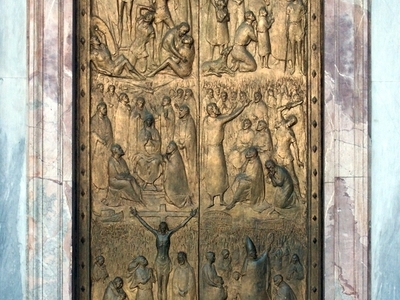 The 20th-century door includes the remains of the leaves from the original portal, executed by Staurachius of Chios around 1070 in Constantinople, with scenes from the New and Old Testament. On the right is the Holy Door, which is opened only during the Jubilees. The new basilica has maintained the original structure with one nave and four aisles. It is 131.66 metres (432.0 ft) long, 65 metres (213 ft)-wide, and 29.70 metres (97.4 ft)-high, the second largest in Rome. The nave's 80 columns and its stucco-decorated ceiling are from the 19th century. All that remains of the ancient basilica are the interior portion of the apse with the triumphal arch. The mosaics of the apse, work by Pietro Cavallini, were mostly lost in the 1823 fire; only a few traces were incorporated in the reconstruction. The 5th-century mosaics of the triumphal arch are original: an inscription in the lower section attest they were done at the time of Leo I, paid by Galla Placidia. The subject portrays the Apocalypse of John, with the bust of Christ in the middle flanked by the 24 doctors of the church, surmounted by the flying symbols of the four Evangelists. St. Peter and St. Paul are portrayed at the right and left of the arch, the latter pointing downwards (probably to his tomb). According to tradition, Paul's body was buried two miles away from the place of his martyrdom, in the sepulchral area along the Ostiense Way, which was owned by a Christian woman named Lucina. A tropaeum was erected on it and quickly became a place of veneration. Constantine I erected a basilica on the tropaeum's site, and the basilica was significantly extended by Theodosius I from 386, into what is now known as Saint Paul Outside the Walls. During the 4th century, Paul's remains, excluding the head, were moved into a sarcophagus. (According to church tradition the head rests at the Lateran.) Paul's tomb is below a marble tombstone in the Basilica's crypt, at 1.37 metres (4.5 ft) below the altar. The tombstone bears the Latin inscription PAULO APOSTOLO MART ("to Paul the apostle and martyr"). The inscribed portion of the tombstone has three holes, two square and one circular. The circular hole is connected to the tomb by a pipeline, reflecting the Roman custom of pouring perfumes inside the sarcophagus, or to the practice of providing the bones of the dead with libations. The sarcophagus below the tombstone measures 2.55 metres (8.4 ft) long, 1.25 metres (4.1 ft) wide and 0.97 metres (3.2 ft) high. Here's the our members favorite photos of "Churches in Rome". 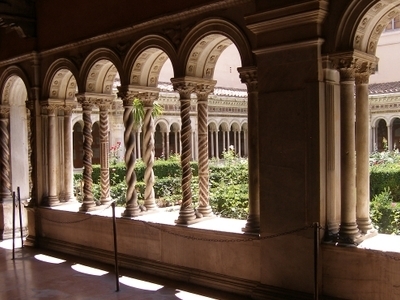 Upload your photo of Basilica of Saint Paul Outside the Walls! 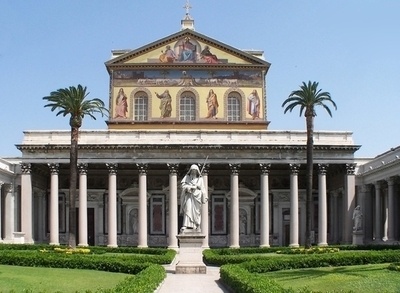 Tom Chambers is the only Touristlink member to visit Basilica of Saint Paul Outside the Walls. Have you been here? Click here to save it.